History records the first owner of Terworm Castle as the Lord of Strijthagen. At that time the castle was a building surrounded by a moat and further fortified by walls outside the moat. The sheriff of Heerlen, Diederick van Pallandt, acquired the property in 1498. Fire destroyed it in 1550, but it was soon rebuilt in the same style but of brick. Over the centuries a number of aristrocratic families lived here. In 1767, Count Maximilian van der Heyden-Belderbusch installed new gardens in the French rococo style popular for the time. In the 19th century, Baron François de Loë remodeled the castle in a neo-Gothic style, which is what we see today. A nearby mining company took over the property for most of the 20th century, housing some of its staff here. When the mine closed there was some talk of turning the property into a major theme park, an idea that met with strong complaints and a protest march from the locals. Meanwhile, the castle slowly deteriorated until the Van der Valk hotel chain bought it. After a 1997-1999 restoration, the castle began its new life as a hotel and restaurant. Usually I’m a strong believer in that if you go to the trouble of seeking out a castle hotel, stay in the castle and not the annex. But here, the rooms in the Farmhouse are very nice, and you don’t lose too much by opting for one of them, especially if you’re on somewhat of a budget. For more of a romantic splurge, though, pick one of the suites. Heerlen is east of Maastricht. Take A79 to N281 and go north in the direction of Eindhoven. Exit: Parkstad 9200-9400 and go straight. 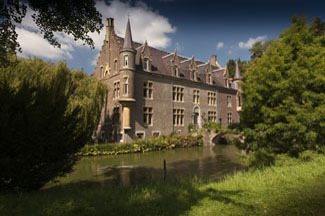 Kasteel TerWorm’s theme “experience nature in the city” describes this beautiful castle hotel oasis. Even though you’re not far from the highway, you don’t hear noise from the traffic—only the sounds of birdsong and quacking ducks. On the grounds you’ll find Rococo gardens that have been perfectly restored to their original 18th-century layout, with roses, lavender, boxwood, and old fruit trees. There’s even an estate beekeeper and some sheep to complete the idyllic picture. Guest rooms may either be in the castle or the farmhouse. Each is individually furnished, and you’ll find either brightly colored furniture with color-coordinated wallpaper or exposed brick walls with hardwood floors. The suites are especially nice. The Baron and Baroness suites have claw-foot bathtubs and romantic turrets where two can sit and view the castle gardens. Inside the castle, you have the Baron suite deluxe, which features a bath with whirlpool and a steam and shower cubicle for two. There’s also a double window seat in the turret with a view of the garden. For formal dining, the castle restaurant offers a set menu or a la carte choices. Lunch may be taken either on the outside patio or at the “Auberge,” which is built into the castle arches with charming outside views. Among its packages, the hotel offers a special kids package for guests from 4-12 years of age. They can learn how to make their own ice cream or have free use of the swimming pool at a neighboring hotel.